I am a recently converted oyster fan. I never liked fresh oysters because they look weird and smell like the sea (obviously). But because my friends are into it, I thought I'd try and see what happens. The first time I ate oysters, I had what it felt like food poisoning. So I promised myself never to eat oysters again. But then again, some promises are meant to be broken. It's really hard to keep a promise especially if you are constantly being thrown into the same thing- just like eating oysters. 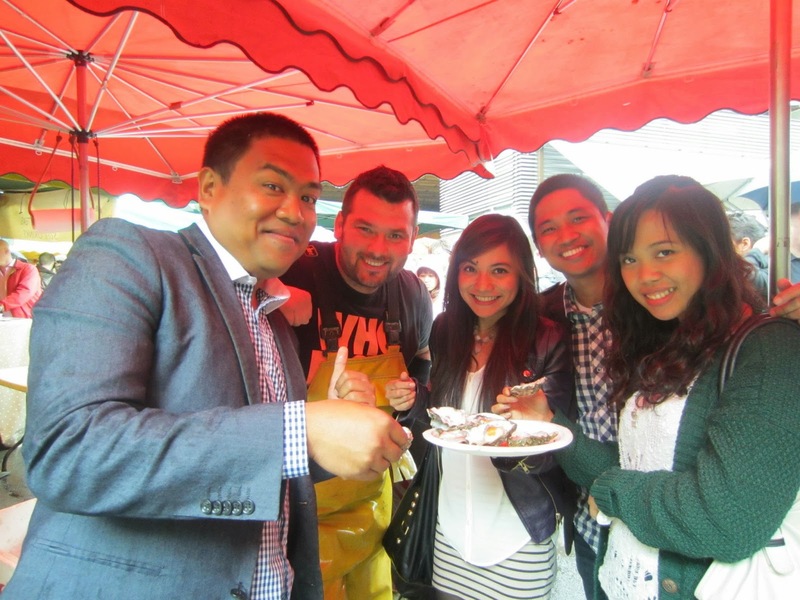 Since we discovered the oysters at Borough market two years ago, we have been going there at least every other weekend, so it was difficult for me not to give those monsters a second chance. Watching those oyster loyalists eat like it's the most delicious food on earth made me so jealous. So when I tried it again this time, I couldn't eat just one. I had four and yes, I wanted more but I didn't want to overdo it. And yes, there is a queue for the oysters. I think the reason why I liked the oysters better this time is because I put a lot of vinegar and onion. That's the trick I guess. And if you're wondering who Richard Haward is, I had the chance to meet him the last time I was at his oyster shop. So now I can officially say that I am an oyster fan. These days, I always look forward to going to Borough Market on weekends for two reasons: Oysters and Paella. I will tell you more about paella next time.